No need for studded tires unless you're in the northern provinces. Winter tires too noisy? Geez. I was driving 250k a day 4 days a week all last winter to get to work. In a lowered sunfire that had regular canadian tire nordic winters on it. Only problem was the tires are more deep snow biased then ice. But as long as you are comfortable driving in the winter, any snow tire will do, all season FTL. Altimaxes were Phenomenal last winter. My blizzak WS50s on my maxima were better initially for like 5k miles, but once the thin layer of special cell compound wears off, the Altimax arctics are better in all aspects. Ride nicer, quieter, and excellent, excellent, excellent deep snow traction. So good, i have ice wounds on my bumper from showing off in a unplowed parking lot. Anybody know if there are any RTX Wheels that will fit? I found 2 sets of 17"X7 with 5-110 and a +42mm offset. 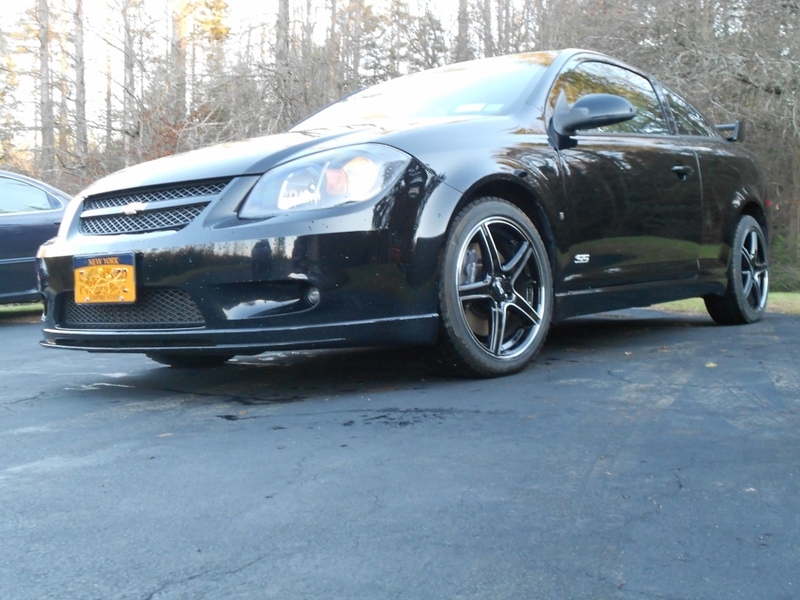 I kinda skipped around in this thread but i just threw a set of Ion Redline wheels on my 09 for winter with a set of ws-70 blizzaks. The clearance is........tight but they do JUST barely clear....i'm talking a piece of paper clearance......i know i know its dangerous......i live on the edge, lol. Why don't you use the smallest spacer possible? My BSA 264s were like this - I just ran a 3 mm spacer on the front to be safe, never any issues. SS is gone now, though, so anyone want to buy them? I bought a set of blizzaks last season for the winter for the stock rim and they worked great. what would be the point of running a smaller rim for a winter tire? if u go to a GM wheel,they usually are 7 inches wide i believe. cuts thru the snow better. You will get more tire and less rim by going down a size. Yes, a smaller rim is more narrow and with a taller sidewall. This will decrease the contact patch of the tire which increases the traction in the snow because more pressure is applied per square inch to dig in to the snow. A narrow tire is always better in snow and rain. Anyone else get a SVC warning sometimes with aftermarket rims? Ill randomly be driving around and ding ding ding ill get it and then it just won't display one of the tire pressures. I've been shrugging it off for a year just telling myself it's just cuz it has aftermarket rims on. Why bump an old thread? Your answer is simple, your tire pressure sensor is cracked or not reading right. saw a winter tire package on discount tire, 17" wheels, 7.5" wide, offset of 35mm, and 5.55 backspacing anybody know if they will fit? Got these from discount tire group. Not as nice as page 7's Koz's Drag-dr34's. I think I'd rather of bought those, but im stuck with these. Those look like a sicker version of mine! without the huge gay middle hub cab thing. Post up a pic of when you do decide bro. **** me... Does anyone know why my car's front and rear look darker grey than the rest...It looks almost photo shopped, but I took this myself on a cold fall rainy overcast day. I'm hoping it's just the angle but it looks horrible. I don't have the car in my possession now it's getting rust coated overnight at my old boss's shop. I've never noticed this in person which makes me wonder. Thanks wrxpappy for the heads up. I've noticed it on mine, both bumpers appear to be darker like they weren't properly primed so since the plastic is darker than the painted metal it makes the color appear a bit darker? Interesting. Once I get my car back today I'll look deeper into it. Literally. It just astonishes me I've never noticed this. It looks like I have the two diff GM silvers. Andrewcarr1993 do you have a silver balt aswell or was yours black? I found these wheels from tirerack.com, and there are no rubbing issues, or clearance issues with the Brembo calipers. $109 each, and make great winter wheels! And a pic of my car with them on. any wheels that are cheap, plentiful (find used) that would fit over the brembos?